An instant rebate of $40 per speaker has been applied to the regular sale price! Price shown reflects price after rebate. Offer valid through April 30. The JBL 305P MkII 3 Series compact powered studio monitor makes legendary JBL performance available to every studio. With the revolutionary JBL Image Control Waveguide and refined transducers, JBL 305P MkII 3 Series offers stunning detail, precise imaging, a wide sweet spot and impressive dynamic range that enhances the critical listening capabilities of any modern workspace. Featuring patented technologies derived from the JBL 7 Series and M2 Master Reference Monitors, and sporting a sleek, modern design, JBL 305P MkII delivers outstanding performance and an enjoyable mix experience at an accessible price. Since their release, word has spread on the quality and value found in the original JBL 3 Series, resulting in wide adoption from hobbyists to high-end professionals working in music, film, post, and broadcast production worldwide. With such an obvious hit, you might ask, "Why update now?" On every project at JBL, there's always a handful of features or improvements that the engineering team can't squeeze in before going to production. 3 Series was no different. When the opportunity presented itself, we decided to make those final improvements to the transducers, add a frequently-requested feature, and apply manufacturing learnings. The result -- an edition of this popular studio monitor that retains the best qualities of the original, but now looks better, sounds better, and provides transparent sound in even more production environments. Reveal impressive detail, ambience and depth in your mixes thanks to the groundbreaking JBL Image Control Waveguide. Originally developed for JBL's flagship M2 Master Reference Monitor, this patented innovation ensures an acoustically seamless transition between the low- and high-frequency transducers and provides an immersive soundstage with precise imaging. Offering a broad sweet spot and neutral frequency response, JBL 305P MkII delivers a crystal-clear representation of your mix -- revealing subtle details, even when listening off-axis. To help you make the best mix decisions, JBL equipped the 305P MkII with acclaimed 3 Series transducers that now perform even better. Hear deep, accurate and tightly controlled bass thanks to a long-throw 5" woofer and the patented JBL Slip Stream low-frequency port. Enjoy soaring, immaculately detailed highs via the woven-composite 1" Neodymium tweeter. JBL engineers took things to the next level with faster HF transient response through fine-tuned ferrofluid damping, and greater low frequency linearity and lower harmonic distortion courtesy of an enhanced woofer design. The result is a studio monitor you can trust -- with unmatched peak handling, stunning dynamics and neutral frequency response that's unbeatable in its class. JBL 305P MkII is ready for the most demanding production styles right out of the box. Dual integrated Class D power amplifiers, custom designed by JBL for each transducer, give you generous dynamic range for any project. From music production and podcasting to cinematic sound design or daily vlogging, enjoy the output and power you need to hear exceptional detail at any volume -- even at peak SPLs. Simply plug in, power on, and start creating. The dimensions and acoustics of a room can have a major effect on sonic accuracy, and that's why JBL 305P MkII lets you adjust the response to fit your studio. The Boundary EQ attenuates the low-end boost that can occur when you place monitors directly on the desktop or near walls. The 3-position HF Trim switch allows you to adjust the high-frequency response of the 305P MkII to tailor it to room acoustics or personal tastes. The design of the 305P MkII leverages over 70 years of JBL acoustic expertise to create a refined studio monitor at an outstanding value. While other manufacturers use off-the-shelf components and make subjective decisions about the sound, JBL builds speakers that squeeze every ounce of performance from each component to deliver efficient, accurate sound reproduction. 305P MkII is designed to JBL's Linear Spatial Reference criteria -- a series of 72 individual measurements taken 360 degrees around the speaker to ensure a faithful reproduction of your mix, whatever your listening environment. JBL Professional studio monitors are designed for reliable performance, even when projects push your gear to the limit. Before being approved for production, 3 Series monitors must first pass JBL's strenuous Power Test. Each model is required to perform flawlessly at maximum volume for an unheard-of 100 hours -- without failure. As a result, you can depend on 305P MkII monitors to deliver consistently excellent sound reproduction for years to come. - LF Driver Size: 203Mm (5"")Lf Driver Size	203Mm (5"")"
Overall: Was intending to get the older lsr305s on black Friday but they sold out. So glad they did because I ended up with these instead! I'm a beginner at home recording and I have a small mediocre recording desk set up with these monitors. Right off the bat I was blown away by the stereo imaging these produce. I've never used monitors before so this was so much fun. I went through my music library breaking these in and listening to my favorite songs. I was hearing things I've never noticed in songs I've listened to all my life! Very clear, punchy, and so far these translate very well to other audio systems. My old studio headphones did not translate well to my car stereo. These monitors have made a huge difference in my recordings so far and it has been a blast every step of the way on this first month of ownership. Look forward to how they will help me with future projects! If you're looking for a great way to start in to home recording but have a limited budget, these are the way to go with zZounds' pay as you play plans. I had them out of the box, set up and playing in less than 5 minutes. 1000000% happy with my purchase. "Best Monitors For The Price!" Overall: I am a former owner of the KRK Rokit's and quite honestly, the JBL's are way more balanced and open. I compare these to the Yamaha HS Series, the exception being that these are slightly better in the low end range. 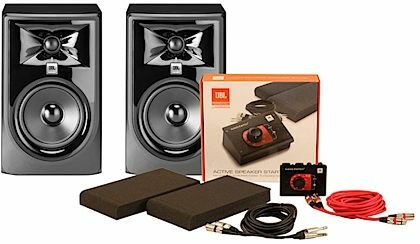 These are great monitors and I recommend these for the artist working on mixes at home, KRK's has some kind of filter on it that makes mixing a bit tougher, these JBL's will get your sound very accurate! Not as pretty as the KRK's or Yamaha's but you'll find the sound to be very professional, I expect these to get on some radars very soon!